Making Serah the protagonist of XIII-2 meant that she had to be given a weapon. Serah doesn’t participate in battles in XIII. She is truly an NPC, and a civilian NPC at that - unlike Nora Estheim who picks up a gun to defend her son, Serah’s fighting skills are next to non-existent. We know they do exist when XIII-2 rolls around - it’s unrealistic for her to know nothing, given she would have to learn the most basic of basics in order to survive out in the wilds of Gran Pulse with the rest of the Bodhum survivors - but even then, Serah teaches the kids. She doesn’t fight. She’s still the civilian. 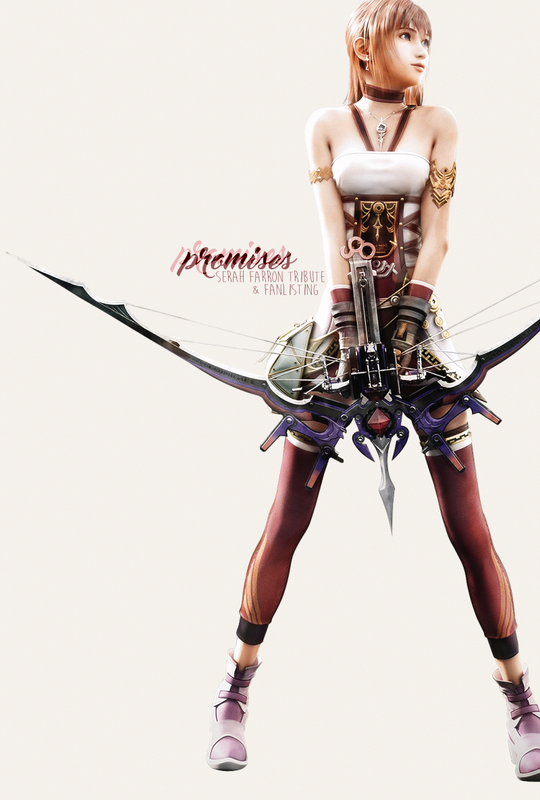 Serah’s weapon reflects that - it also reflects her femininity. Serah’s weapon is deliberately a bow over a gun, unlike that of her sister Lightning, but she does gain the sword anyway. She has less brute-strength in using it, sure, but Serah has the option to fight in far as well as close quarters, and her magic makes up for her lack of experience. Mog likely guides her aim, too, given that Serah’s bowsword is actually him, transformed. The thing is, Mog’s a moogle, the weapon forms from him, it’s magic, but it also allows it to be the impossibility of a sword and a bow as it transforms back and forth at Serah’s will (for instance, if you cast Ruin from a distance, Serah stems the magic from her bicep and channels it through the bow itself). What I’m really getting at here is that it’s unique thanks to its magical qualities and is actually very suiting. She doesn’t have to choose between sword and bow. Serah gets both. The bowsword reflects that Serah doesn’t have to give up any part of herself to go out there and save the day. But she does have to change. Lebreau says it first. When New Bodhum is attacked, Serah is, admittedly, confused and slightly dazed, and Lebreau doesn’t know about any of her visions - she sees Serah stumble, asking for Lightning to save her, but Lightning can’t protect Serah anymore. The intent is clear; like Lebreau, Serah has to protect herself. By the time Noel says it, asks her if she can fight - ”if I have to,” Serah says, which Noel replies she will - Serah doesn’t delay. She has no further plans of laying down and waiting to die… not just in a battle, when she’s in danger, but in life, too. Waiting isn’t good enough. If she wants to see Lightning again, Serah has to venture out into the world and its mysteries and find her sister for herself. And she has to keep changing, growing, learning, in order to do so. Her persistence will carry her to her ultimate destination, but it’s the journey that moulds Serah. The first step is to enter the timegate, and Serah cuts the cord to her dependency, and is forever changed - no longer will she wait on others to make things happen. No longer is she purely the motivator, the catalyst of events. She’s a fighter, a survivor, a changer of time.